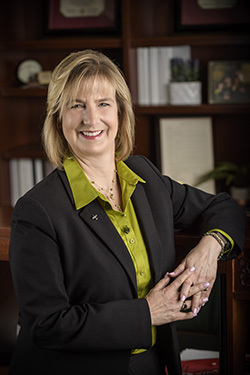 In her first year at Wright State, Schrader emphasized financial sustainability, administrative transparency, and campus conversation. She also fostered a campus atmosphere aimed at tackling broader domestic and global issues that provide opportunities for graduates to excel in fields that will define the future. Schrader encourages innovative strategic approaches to university business and creativity in classrooms and laboratories. Schrader previously served as associate vice president for strategic research initiatives at Boise State University and dean of the College of Engineering at Boise State. She held numerous academic positions at The University of Texas at San Antonio, including associate dean for graduate studies and research for the College of Engineering and the College of Sciences, university graduate recruitment coordinator and associate research center director. An accomplished electrical engineer, Schrader's research background is in the area of systems and control. She has received several best paper awards; written more than 100 publications in the areas of systems and control, robotics, and intelligent systems, with biomedical, networking, and aircraft applications; and delivered more than 100 presentations and keynote addresses. Her grant and contract funding exceeds $11 million. Schrader is a recipient of the Presidential Award for Excellence in Science, Mathematics, and Engineering Mentoring from the White House; the Hewlett-Packard/Harriett B. Rigas Award from the Institute of Electrical and Electronics Engineers (IEEE) Education Society; the Idaho Women Making History Award; and the WebCT Exemplary Online Course Award. She was also named one of Valparaiso University’s Top 150 Most Influential People. She received the 2013 Distinguished Educator Award from the Electrical and Computer Engineering division of the American Society for Engineering Education (ASEE) and was named an ASEE Fellow in 2017 for her outstanding contributions to the field, a rare honor conferred on only a small fraction of the society's members. Schrader was also named an IEEE Fellow in 2014 in recognition of her leadership and contributions in engineering education. Schrader’s husband, Jeff, served for many years in the legal profession. The couple has a son, Andrew, who is pursuing a Ph.D. in mechanical engineering at Georgia Tech, and a daughter, Ella, who is in middle school. Jeff Schrader has been a practicing attorney for many years. In his last position he served as legal counsel to the Idaho State Board of Education, the public education policymaking board in the State of Idaho that governs the state’s higher education institutions and establishes public education policy for K-12 schools. This role was particularly enriching because it provided the opportunity for Jeff and his wife, Cheryl B. Schrader, Ph.D., the president of Wright State University, to interact on an array of public education policy and content areas. Previously, Jeff served as a public sector lawyer for a variety of government entities in the State of Texas. As a member of the general counsel section of the District Attorney’s Office of Bexar County, in San Antonio, Schrader's legal practice included extensive business transactions work, especially related to tax incentives and economic development projects. He received the honorary title of “Hidalgo” by the Bexar County Commissioners Court for his legal services. He also served as associate general counsel for the Texas Banking Department in Austin, where he worked on state bank and trust company matters. This followed a stint in private practice at a boutique law firm in San Antonio, where he specialized in bank and trust, corporate, securities, and real estate law. Schrader began his law career as in-house counsel for Exxon Corporation in Houston, where he practiced litigation and advised the marketing department on antitrust and petroleum marketing matters. Schrader earned a bachelor of science in business administration from Valparaiso University, majoring in finance and minoring in political science. As a student at Valparaiso, he participated in an overseas study program in Cambridge, England, which enabled him to travel extensively through Europe. He earned his J.D. in 1988 from the University of Notre Dame, concentrating in business, corporations, and securities law. 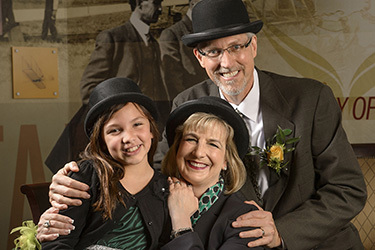 Jeff and Cheryl Schrader met as students at Valparaiso. Their son, Andrew, is following in his mother’s footsteps by pursuing a Ph.D. in mechanical engineering at Georgia Tech, and their daughter, Ella, attends school in Beavercreek, Ohio. Jeff and Cheryl share a variety of interests, including reading, gardening, and traveling.